The 1935 Declaration of Intention for James Neill, Sr., was a treasure trove of genealogical information. The 56-year old millworker stated that he was born in Limavady, Ireland on 24 May 1878 and married in Ireland in 1895 to Margaret. Her maiden name is unstated in his statement, but he indicated that she was born in Limavady also on 24 May 1876. 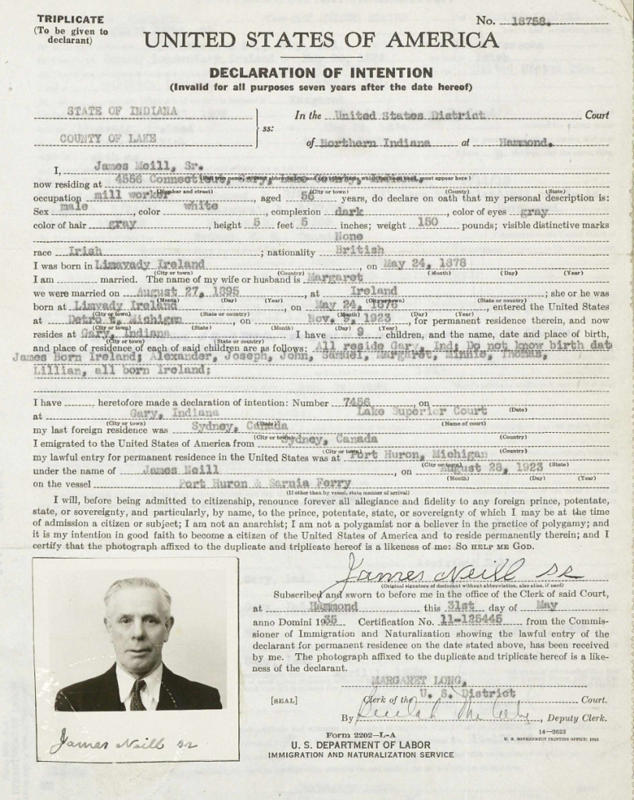 James entered the United States in 1923 through Detroit, Michigan, and at the time of his statement lived in Gary, Indiana. He had nine children. All of them were born in Ireland and all of them were living in Gary, Indiana. James did not know (or have) their dates of birth, but indicted his children were: James, Alexander, Joseph, John, Samuel, Minnie, Thomas, and Lillian. Without stating how long he lived there, James indicated that his “last foreign residence” was in Sydney, Canada. James’ declaration was made on 31 May 1935 in Hammond, Indiana, before the United States District Court of Northern Indiana. This image was made from a digital image of the declaration obtained on FamilySearch. The 56-year old Irishman was five feet five inches tall, weighing 150 pounds. He was of dark complexion with gray eyes and gray hair. He was living at 4556 Connecticut at the time of his declaration. James would have had primary knowledge of the information contained in his declaration–except for his precise date of birth and that of his wife. Given that this statement was made in the 1930s, he likely would have had documentation to support his date of arrival. The dates of birth for he and his wife could be verified by vital records in Ireland. Interestingly enough, several of James’ children have first names that were also used in the family of his uncle, Samuel Neill, who died in Hancock County, Illinois, in 1912. That Samuel also had children named Joseph, John, Samuel, and Margaret–and used Thomas as a middle name. The names are not unusual, but the commonality is noted. The greatest thing on the document is James’ picture. While “looks like” is not proof of a relationship, seeing a family resemblance can, at the very least be a spooky experience. I never saw a member of my Neill family who looked like Herschel Neill, my grandfather Neill’s younger brother–until I saw this picture. My memory of my uncle Herschel is when he was fifty and older and James bears a striking resemblance to him. The common look was so striking that I remarked “(@*#& that’s Uncle Herschel” when I saw the picture. This James Neill would have been a first cousin, once removed to my Uncle Herschel. 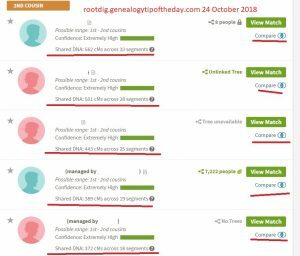 I have shared DNA with ten of James’ descendants that confirms the genealogical relationship that has been established on paper. But that picture really seals the deal. I know shared looks are not a part of any genealogical evidence model and I’m not suggesting they should be, but sometimes they really make the connection jump out at you.